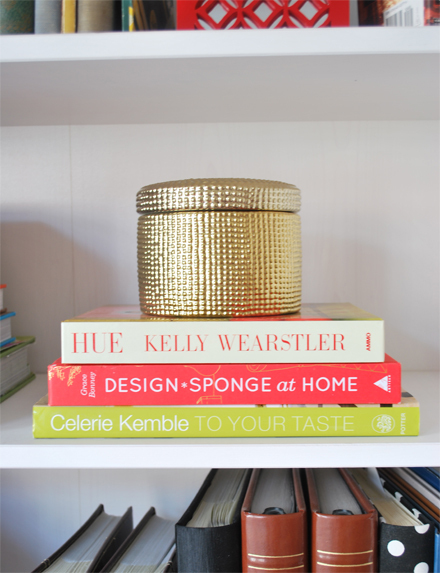 My little gem of a gold ceramic jar that I got from H&M's new online home store. Boy, do I have lots to share with you. We got a few things for the house recently, and we are getting more things for it. Instead of me babbling away here, I've explained below along with the photos. Enjoy! Remember this chair? Well, I finally picked a fabric that I could see working in our bedroom. 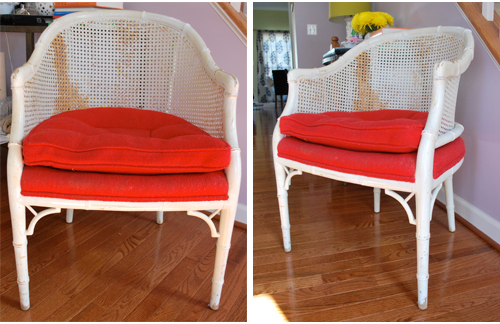 So this little beauty is going to get reupholstered this week! Woohoo! 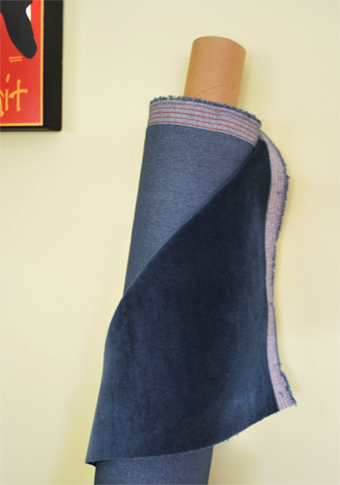 I got this gorgeous blue velvet from my local JoAnn fabrics. I had to special order it but it took no time at all to receive. Four days tops. Quick, right? And the best part is that it was on sale since I had a coupon. You ready for this?? 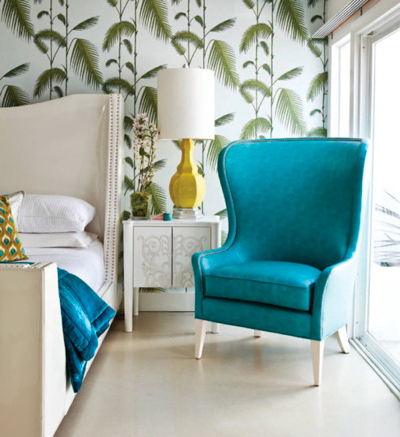 Sooo, we all know how much I like wallpaper. Right? It's no secret. And goodness knows Steve hears about it all the time. Well, I mentioned earlier that we're getting the powder room wallpapered and the wallpaper below is what we're getting it done in! It's not what I had originally planned for the space, but you know, when you come across a find like the one below, you don't pass it up. Especially when it was $40 for all 4 rolls on eBay! 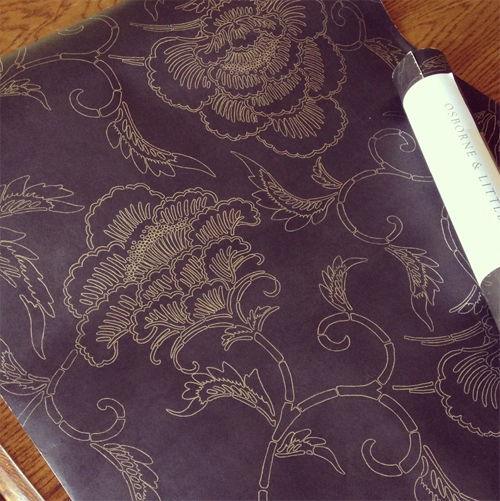 If you can't find it on eBay, here's where you can find the Osborne & Little Tara Tullynally wallpaper. 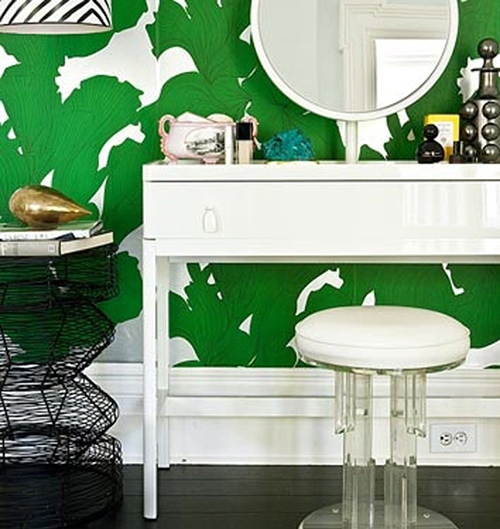 And as if just wallpapering the powder room wasn't enough. We've got two other places in mind to have done eventually. Maybe not right away, but it's definitely something on our radar. And when I say "our" I actually mean it! Steve has seen the light and is agreeing to these updates. Let me backtrack a bit. 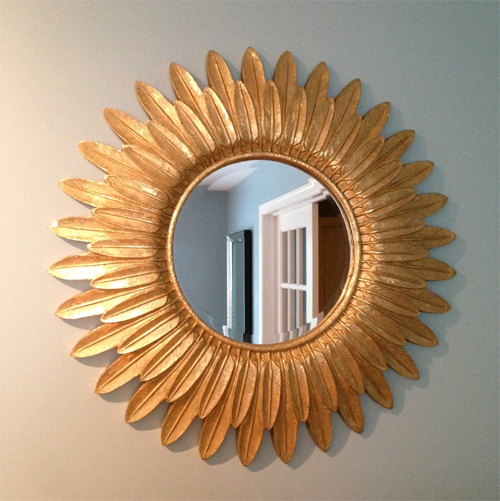 I know I said that the Martinique would be perfect for our entryway, and well it certainly would be perfect there. But we got to thinking that we would enjoy it more if it was in our kitchen/dining room as a statement wall. Here comes the kicker though. At $250 a roll (and we would need 6 rolls, so do the math here) we just can't do it right now. It kills me to say that, but one day in the near future, it'll be possible. In the meantime, I've found two other alternatives to the Martinique. I know, how are there alternatives to that wallpaper? Well, when you don't want to spend $1500 you find alternatives. I've always loved the two below, but never thought that Steve would like them let alone stomach having them in our home. Guess I shouldn't say never, huh? Because he actually likes them! Guess the $1500 price tag on the other one scared him into liking anything else, haha. Although, now we're thinking that either one would look great in the entryway too. I ordered samples of both so we can see how it would look in each room (cause you just never know in person versus online), so until then the decision will be up in the air. I'm really torn because both would look great in either space, so I seriously cannot wait to see these samples. I'll of course let you all know what we decide, but I just wanted to fill you in on what's been going on around here. Happy Monday! That mirror is amazing, can't believe the price! And I love the fabric you choose for the chairs! So much fun going on! That blue velvet is amazing! Can't wait to see how it turns out! Love that paper!!! It will look smashing! Hope all is well and that youre having a great summer. @Kristen - Thanks girl! I hope it turns out okay, haha. I always get nervous about reupholstery jobs even though my upholsterer is great. Silly, huh? I can't wait to show you all too! @Nancy - Thanks Nancy!! I hope so, I still can't believe we're finally getting something wallpapered! It's like a dream I tell ya ;) I hope you're enjoying the summer too! Hope to see you soon!